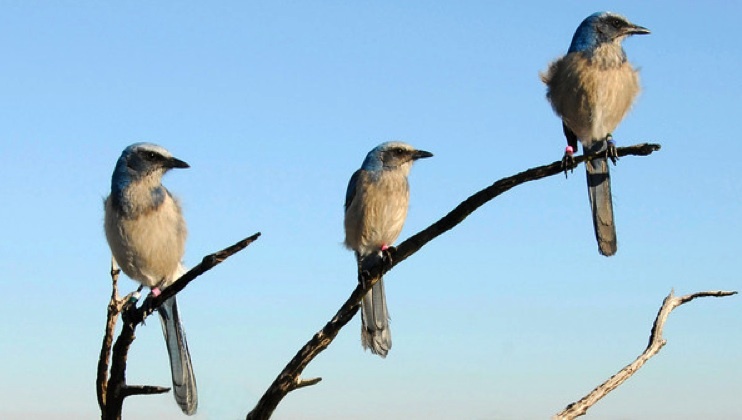 Is there hope for the Florida scrub-jay? The wind blows constantly across Florida’s Merritt Island, carrying the scent of Atlantic salt into the scrubland and slash pines. The dense palmettos are buffeted together, their rattle adds to the roar of the wind, the scream of the ospreys, and the distant sputtering of motorcycles. Then the low roar is broken by a flash of blue and a bright, rasping call. Perched on a thin oak branch above the palmettos, a jay sways in the wind. He twitches every few seconds, peering around as he shrieks a warning. The Florida scrub-jay reigns supreme over his little territory. Tied by evolution to the Florida scrub, this bird lives nowhere else in the world. As land across the state is gobbled up for agriculture and development, hundreds of thousands of acres of scrub have been set aside for conservation during the past two decades. But the Florida scrub-jay population, estimated at just 7,000 birds in isolated pockets around the state, continues to dwindle. “Whether the scrub-jay lives or dies, locally and regionally, is all going to be a question of land management,” says John Fitzpatrick, the director of the Cornell Lab of Ornithology in Ithaca, New York. 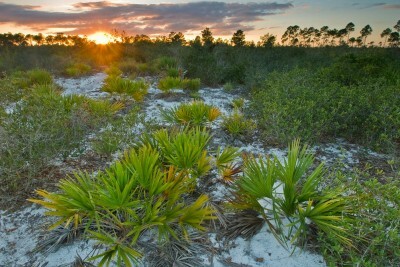 In the Florida scrub, land management means one thing — fire. Fire is common in Florida. “A lot of people probably don’t realize how much Florida used to burn historically and how much Florida’s plants and wildlife really depend on periodic fire,” says Craig Faulhaber, the Florida scrub-jay conservation coordinator for the Florida Fish and Wildlife Conservation Commission. Scrub is an ecosystem in transition; fires help prevent it from transforming into woodland. But decades of fire suppression by humans resulted in many acres of overgrown scrub that are unsuitable for scrub-jays. The problem is especially acute in Florida, where frequent thunderstorms and hot weather fueled the evolution of fire-dependant ecosystems. By setting the scrub ablaze in controlled burns, land managers in Florida can restore it to its natural state. Just under a foot long from beak to tail-tip, scrub-jays are a dusky gray color, with bright blue feathers on their head, wings, and tail. Gregarious and inquisitive, they are known to alight on people, seeking peanuts and other treats. Scrub-jays mate for life, and family groups patrol territories of about 25 acres. They are also one of the few bird species that exhibit cooperative breeding, in which young birds stay with their parents to raise the next generation. Jays are not the only imperiled species in the scrub. Dozens of endangered or threatened species of plants, mammals, reptiles, and insects call it home, including the Florida mouse, the eastern indigo snake, and 29 species of plants. Like the jay, many of these species are found nowhere else on earth. The Merritt Island National Wildlife Refuge, next to NASA’s Kennedy Space Center, is one of the best-preserved scrub ecosystems in Florida. Stunted oak trees rising only a few meters off the ground dominate the landscape. The occasional slash pine overshadows the arid scene, where sharp-eyed raptors rest their wings. Underfoot are palmettos, pawpaw, prickly pear, coral bean, rusty staggerbush, and scrub lupine. Legless lizards called skinks slither through hedges of scrub rosemary, while gopher tortoises burrow in the sandy patches. The visitor center’s wildlife logbook records multiple early-morning bobcat sightings. Dry, sandy soils are the scrub’s downfall because they are so attractive to developers and farmers. “Most of Florida is low and flat, so what humans need for growing orange trees or putting up housing developments, mobile home parks, theme parks, retirement homes, commercial properties and so on is the dry soils, and of course that coincides with what the jay uses,” says Cornell’s Fitzpatrick. At first, scrub was lost to farmers and citrus groves. Then the advent of air conditioning in the 1920s brought more people to Florida, and development has not slackened since. Faulhaber estimates that more than 60 percent of scrub was lost during the past few centuries. As the scrub shrank, so too did the jay population. By 1987, jays were rare enough to be listed as threatened on the federal Endangered Species List. Protection efforts have focused on conserving scrubland. An estimated 347,335 acres of scrubland have been preserved in Florida by federal and state agencies and private conservation groups, according to a recent scrub-jay assessment conducted by Reed Bowman and Raoul Boughton of Archbold Biological Station in Lake Placid, Florida. Yet the assessment was not optimistic about the jay population, revealing that it has declined by at least 35 to 40 percent on public lands since the early 1990s, down to just 1,253 family groups. Estimating the exact number of birds in the scrub is difficult because some areas have not yet been surveyed. Despite this caveat, Todd Mecklenborg, the national lead for scrub-jay recovery with the Florida Fish and Wildlife Service, estimates that there are roughly 7,000 birds left. Jays prefer scrub one to three meters high with sandy openings, says Boughton. Shorter scrub with sandy patches allows jays to detect predators and protect themselves. They have evolved a sentinel system, where one jay sits atop the highest oak and keeps watch for predators. Without fire, growing trees obscure the jays’ vision and attract bird of prey, a major danger. Without sandy areas, the jays cannot bury caches of acorns to help them survive winter. Fire suppression has hurt some species even more than the jay. The Florida grasshopper sparrow inhabits only recently burned areas in the grasslands of South-Central Florida. Jim Cox, an ornithologist at Tall Timbers Research Station in Tallahassee, Florida, estimates that there are fewer than 500 sparrows left. “Florida has about 70 different natural communities,” says Zachary Prusak, a fire manager for the Nature Conservancy, “and most of those have fire somewhere in their life cycle.” The plants and animals in Florida and the pine forests of the southeast have evolved with fire. Without it, they will struggle –– or maybe even disappear. Even humans benefit from controlled burns, advocates say. “It’s better for both people and wildlife,” says Faulhaber. By burning the available fuel, land managers can reduce the severity of uncontrolled, catastrophic wildfires that destroy homes and property. Yet Florida officials have been able to burn only a tiny fraction of the protected scrub. Burning is constrained by money and resources, and a large backlog of protected acreage awaits restoration. The work does not end once scrubland is restored, because without maintenance it will become overgrown. According to Fitzpatrick, the scrub needs to be burned every seven to 12 years in order to retain conditions favorable to jays. 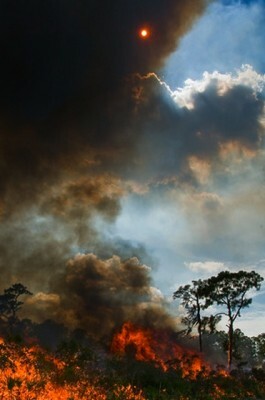 Prescribed burns in the scrub are especially tricky when houses are nearby, as they often are in heavily developed Florida. “Just setting it on fire is, in this day and age, impossible,” Fitzpatrick says, “because you need to worry about who is living downwind.” Land managers are limited by time of year, weather conditions, and money. Occasionally, scrub is so overgrown that mechanical clearing is needed, adding to the cost. These challenges must be overcome quickly if the scrub-jays are to survive. Years of habitat degradation and fragmentation are taking their toll. A 2008 study by Bowman and Fitzpatrick found that Florida scrub-jays have become isolated into 10 separate genetic groups. The bird’s three greatest strongholds are Ocala National Forest, Merritt Island, and the Lake Wales Ridge, near Archbold Biological Station in South-Central Florida. But many of the other genetic groups are perilously close to disappearing. “It is winking out, or getting very close to winking out, in a huge number of small populations around the state,” says Fitzpatrick, “so it’s in this very precarious moment in its history.” The statewide assessment found that in 89 percent of sites managed for jays, the jay population is now absent, recently extirpated, or is so small that it will like go extinct if it is further isolated from other populations. The jay’s territorial nature exacerbates the problem of genetic isolation. Scrub-jays prefer to live near other jays and are extremely reluctant to migrate even two or three kilometers. Their reluctance to move with their already fragmented habitat results in small, limited gene pools, adversely affecting the health of the species. Though their existence is worrying, the discovery of these 10 genetic groups is aiding conservationists. “We are now arguing, hopefully persuasively, that each of the 10 genetic units really demands its own recovery,” says Fitzpatrick. The federal recovery plan is being revised to reflect the new genetic information. Mecklenborg says that the goal is to come up with recovery actions for each genetic unit, with an emphasis on preventing additional genetic isolation. Another shriek, and the jay flits closer. In the shadow of a slash pine, his deep blue plumage stands out again the grays and greens of the scrub. A faded yellow-white band encircles his ankle. The pine bark is blackened, and charred fragments of wood and palmetto root litter the sand, dug up by rooting feral pigs. Merritt Island, the site of annual controlled burns, is now one of the last scrub-jay strongholds in Florida. Where there is fire, the jay thrives. Thanks for a great article. I saw my first scrub jay recently at Oscar Sherer State Park near Osprey Florida. In Hernando County we have scrub habitat in the process of restoration. It is amazing much plant diversity is there since the intruding oaks were cleared away and prescribed burns were started. As the article notes, prescribed burns help many species – not only in scrub habitat but also in sandhill and other pinelands. For those who love wildflowers and butterflies as well as birds, a trip to recently burned scrub or sandhill is well worth the time. Properly managed scrub is beautiful!